Camera system for business for the home OR company in Metro Atlanta, GA.
Have you had an experience differentiating between camera systems for the home OR business? Have you had a security professional consult you on what to look for when shopping for one or the other? Unless the answer is an immediate and assured “Yes,” there’s a lot we’ll be happy to teach you. It’s our goal and mission in the metro Atlanta area to raise the bar for security standards, starting with the individual communities we’ve worked in these last 10 years. At home, your number-one priority is to feel safe. Whereas businesses have other considerations that rightly way on them, like insurance, reputation, and business viability and operations, at home you can’t stand reading the papers and thinking of your household becoming another statistic for Atlanta crime reports. While homeowners have both security and surveillance equipment available to them when they start looking at security systems, one important distinction to make is that security cameras will almost always be the best option in a home. Surveillance cameras only keep that “extra eye” out, whereas security cameras have triggers programmed in to alert your monitoring company as soon as something’s up—thereby dispatching emergency responders. 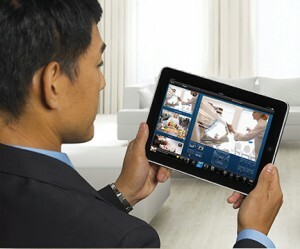 In businesses, both surveillance and security systems have their place. For example, conditions monitoring or employee accountability cameras might be set up without any need for alarms to sound and cause greater disruption. That said, especially with so much of a company’s property stored on a single computer (and being so easy to steal away in a pocket), security systems are equally important in this environment, too. In general, when it comes to the systems available, there’s a great deal of interchangeability between the home and business. The TYPE of camera system is where surveillance becomes more commonly a thing of businesses, while security is almost always the choice for homeowners. It’s not only a family “going big” on the investment in security, installing the equipment marketed as a commercial option. In fact, for the most part, the prices between residential and corporate options is quickly meeting closer in the middle than ever before. But there will also be the time when a small business owner opts for systems that are marketed to homeowners—it all depends on the budget and the need. At Advanced Security and Fire, we take the research around crime and security trends in the Atlanta area very seriously. We do our homework. And, ultimately, the biggest factor when looking at a camera system is who&#39;s installing it. You want local knowledge and expertise, and that’s where we come in! Give us a call today to learn more.